In 1989, Austria began as second European country after Great Britain to mint gold coins. At the introduction of the euro, the nominal value changed from schilling to euro. 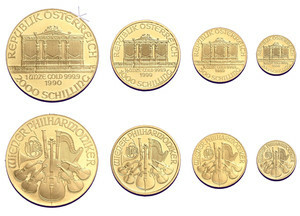 To remind the world´s famous Vienna Philharmonics, on the one side of the coin there are instruments of that orchestra. The fineness and the mint year are on the other side.